Dentsu Aegis Network has bolstered its management team in Newcastle as the business continues to invest in the North East following a period of significant growth. Steve Underwood has been promoted to the role of Managing Partner of Dentsu Aegis Network Newcastle while Ed Ammon takes on the newly created role of Group Business Director. Steve was previously Director of iProspect Newcastle, the network’s digital performance agency, and was pivotal in the defining and implementing the direction, positioning and strategic growth of the business. The promotions come as Dentsu Aegis Network Newcastle plans to expand its office to support the strategic ambitions of the business and its sustained growth. The media and digital communications agency currently employs 25 people across its Carat and iProspect businesses and is taking up additional office space in its current base in Central Square, Newcastle. 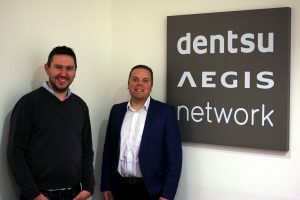 Dentsu Aegis Network Newcastle has created more than 10 jobs in recent months after extending its relationship with key clients and adding a host of new accounts including the Chartered Institute of Marketing and Japanese beverages brand, Kirin. The group has also underlined its commitment to fostering the next generation of marketing talent with the arrival of two new modern apprentices.